Teletron Ltd was founded in 1954 and since then has been dedicated to serving the intelligence and law enforcement community by providing solutions in the field of electronic surveillance equipment. Teletron is a privately owned company with an excellent reputation for quality and technical ability. Its customers include government intelligence and law enforcement agencies in over 30 countries throughout the world. As a member of the European Telecommunications Standards Institute (ETSI) committee, Teletron focuses its efforts in the TSP/ISP / ITSP solutions for Voice/IP/ VoIP mediation devices. 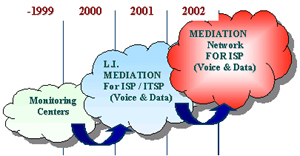 The company develops expansion of the usage of the mediation devices infrastructure within the ISPs to provide information in real-time for applications such as billing, fraud, network management, performance analysis etc.